I explain How to Be in doTERRA FDA Compliance On Your Blog Or Social Media. Are you frustrated learning what you can and can’t say when trying to tell others how awesome doTERRA essential oils are and how they have helped you? You’re not alone. I struggled with this for a long time after learning about the FDA cracking down on doTERRA. Here’s the thing. It’s not all bad. There were doTERRA Wellness Advocates going around saying that doTERRA products could do all sorts of things that they may or may not have been able to do. This new focus will help you focus on the positive effects doTERRA can have on your health and how they can prevent illness and support the structures of the body. It will help make you look more credible because you’re won’t be going around touting how doTERRA is the miracle cure for everything. Plus, you will be protected from accusations from the FDA. If you want to learn how to apply to become a doTERRA certified site and all the rules, then please read this post. doTERRA FDA Compliance: So, how do you know what to say? This video from doTERRA corporation is a good place to start. 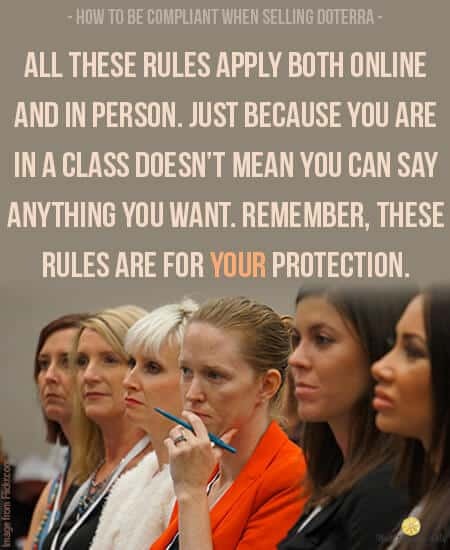 They remind us that these rules come from the FDA, not doTERRA and that these rules have been around for a long time. 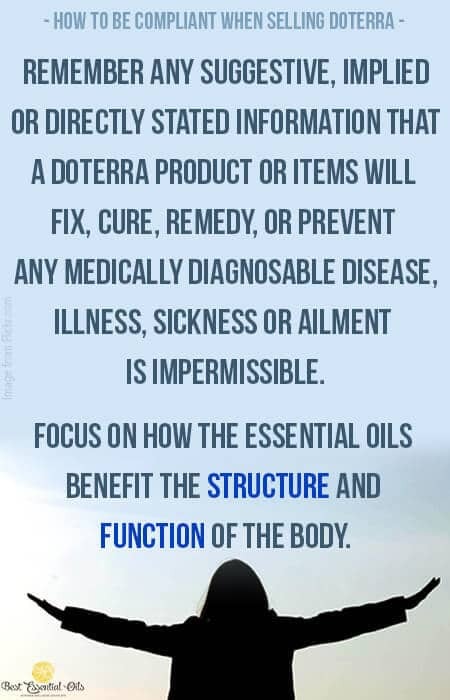 “I have a catch-all statement: Remember any suggestive, implied or directly stated information that a doTERRA product or items will fix, cure, remedy, or prevent any medically diagnosable disease, illness, sickness or ailment is impermissible. 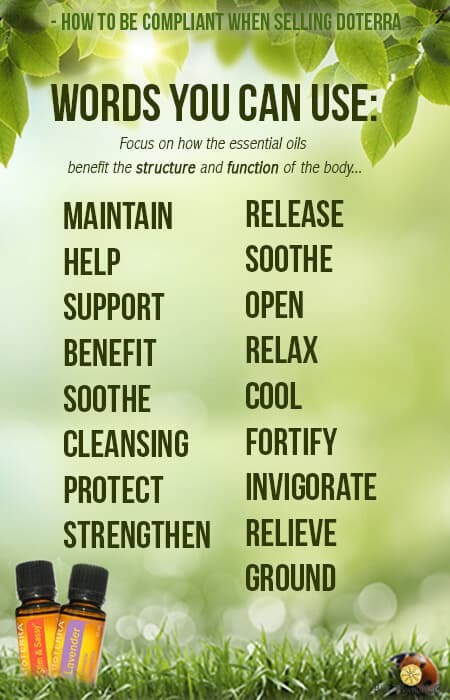 Focus on how the essential oils benefit the structure and function of the body you are talking about and do not mention any names of diseases or imply that doTERRA helps your body move from anything negative to anything positive. Focus only on maintaining the health of body systems. This Quick Claims Guide from doTERRA goes over all the Do’s and Don’ts and Exactly What Wording to use. This document is directly from doTERRA and is a list of all the approved claims for each product. If there is any drug out there, over the counter or prescription, that can help with the problem you are talking about, then that is when these rules apply. You can make claims if you are not trying to sell any product. So, you could say that same oil helped you with some medical condition but you can’t tell them to buy the oil from you or mention any brand names. If you want to do this option, remove any dōTERRA product images, the name dōTERRA, any of the dōTERRA trade dress, or anything else that could associate dōTERRA with these medical claims. All these restrictions do not apply once your audience is already signed up with doTERRA, so you can do things like make blog posts password protected, in a private area or in an email list to members of your team. 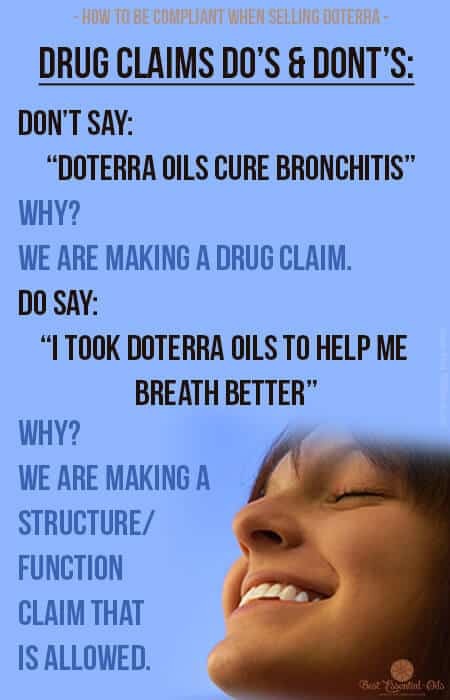 The only websites you are allowed to link to and use information about the products is what is provided by genuine dōTERRA websites, such as www.doterra.com, and www.doterratools.com. You should not use reference guides, like Modern Essentials, in your classes or one-on-ones to people who are not signed up. Many of the tear pads you may have and/or that are currently being sold are not compliant. I recommend using the file I link to above and then AFTER they are signed up, you are more than welcome to use all the resources out there. However, there are parts of Modern Essentials that may be compliant, such as Appendix A: Body Systems Chart. It is not ok to say anything you want and then put a medical disclaimer on your blog or at the beginning of a class. All these rules apply both online and in person. Just because you are in a class doesn’t mean you can say anything you want. Remember, these rules are for your protection. 1. Drug Claims. What’s the difference between the statements “calcium builds strong bones” and “calcium reduces the risk of osteoporosis”? According to the Food and Drug Administration, the former is a structure/function claim, which does not require FDA approval, whereas the latter is a health claim, and so must be approved because it describes a relationship between an ingredient and a reduced risk of a health condition. If we say that an oil cures an ailment, like bronchitis, then we are making a drug claim. If I say that I took an oil to help me breath better or the oil helped my lungs to perform at an optimal level then I am making a structure/function claim that is allowed and permitted. 2. Drug claims to sell products. The use of trademarks is the strike point where you move from education into the area of sales. For example, the FDA issued a warning letter to a company that sold an essential oil product called GermBullet that claimed that it was “laboratory tested and shown to reduce illness-causing bacteria, cold and flu viruses”. 3. Personal testimonials. The FDA is not concerned with what happened to you even if it is true. 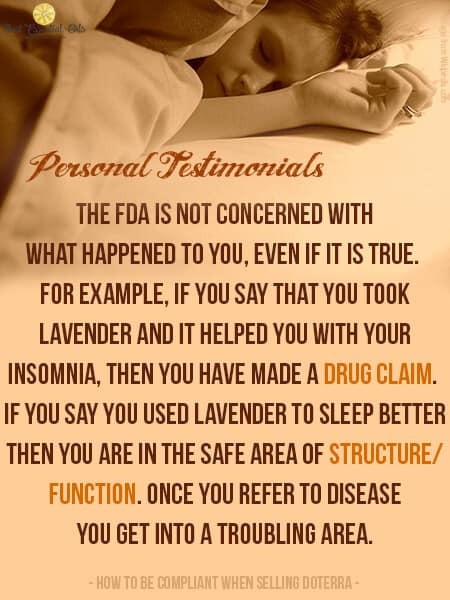 For example, if you say that you took lavender and it helped you with your insomnia, then you have made a drug claim. If you say you used lavender to sleep better then you are in the safe area of structure/function. Once you refer to disease you get into a troubling area. 4. How do you deal with the research that is accessible in the marketplace as it relates to claims? Third party materials are permitted. Refer to the entire body of research— including the research’s strengths and weaknesses. For example, you can say: “Frankincense has done a great job strengthening my immune system. Go to the Aromatic Sciences website to learn more about it and see the research.” The FDA likes to see the separation of education and research from the sales process. I hope this helps you learn about doTERRA FDA compliance. Thank you for this! It is extremely helpful. Good to hear! Glad I could help. Thanks for this Rebecca! As a new wellness advocate, I’m learning the ropes and bookmarked this post. It is very similar to my knowledge of how to talk about herbalism so although I’m a bit squeamish to write about my personal experiences with EO’s I think it will all fall into place… so glad I found you! I’m glad you found me too! Thanks for commenting. According to the Doterra compliance rules we can’t link any Doterra pages to a personal web page. Just wondering how you are compliant with your below link for wanting to join Doterra and it going to your personal page? It used to be that you couldn’t, but now if you have the doTERRA compliant seal, then you can link to your personal page. And how do you go about getting that seal? Thank you for the response!! Hum. I can’t remember. Just email customer service and they will be able to steer you in the right direction. Thank you for posting this! It really cleared some things up for me! Beautiful site! I’m so glad I could help. Thanks for stopping by! This is exactly what I needed!! I am new to doTerra and I didn’t know these things. thank you a ton! I’m so glad I could be helpful! I was totally lost at first (and still get a little lost now sometimes and have to refer back to this post).